Jolande works as instructor in pop and jazz singing at the ArtEZ School of Music in Arnhem (www.artez.nl). She teaches main subject classes in singing as well as duo singing, improvisation, stage presentation and teaching methodology. She also participates in peer reviewing for teachers. Her first singing lessons and workshops were based on the method of the Roy Hart Theatre. This method focuses on opening the voice and strengthening its connection with the body. 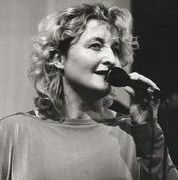 Jolande’s work as a singing teacher is inspired by a combination of Roy Hart, Core Singing, CVT and classical vocal technique. Since 1983 Jolande has performed with various bands and big bands, including Dr. Jazz & Co, Rosie Dawn Jazz Quintet, Hein de Jong Quintet and the vocal groupe Tamam. With composer Martin Fondse she was part of the duo and later quintet Jerusalem Artichoke from 1995 through 1997, where she performed musical settings of Dutch poems. Jolande frequently works as a vocal coach for theater productions. Her approach to singing has been broadened by her collaborations with actors, singers and dancers. Jolande provides training for professional singing teachers and is regularly hired as communication trainer for training workshops where music is the method of communication. Besides teaching (future) professionals, Jolande has since 1987 worked for music academy De Lindenberg in Nijmegen, where she provides, among other things, singing lessons, interpretation lessons, vocal coaching and group lessons for young students. Over the course of years she has developed a range of new courses and teaching methods. At De Lindenberg she also led an acclaimed close-harmony choir. Finally, as a senior instructor, she has provided training for teachers at De Lindenberg. 1991 Bachelor singing pop & jazz at the conservatory of Hilversum. 2001 Communication Trainer, JJ Training Academy Amsterdam. 2011 The Teacher Certification Core Singing. Annecy, France.